As communication networks digitized replacing rotary telephones with the Internet, transportation networks will digitize. 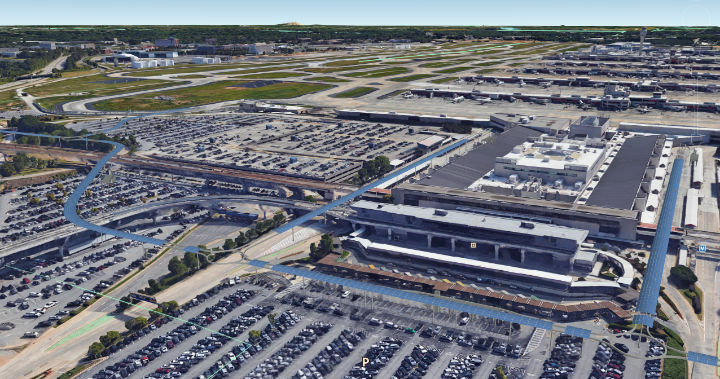 Following is a summary of the capital flows to implement the digitizing of mobility networks forcused on a specific project at the Atlanta airport. Who Pays to Build JPods Network. 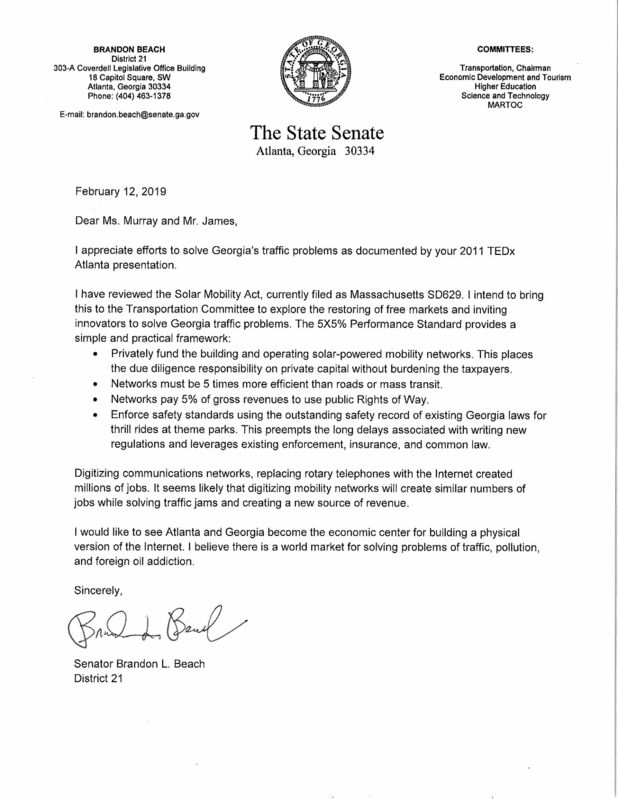 Senator Beach and the Georgia Senate Transportation hearing, March 12, 2019 on solar-powered mobility networks moved Georgia to restoring liberty to invent and liberty for people to choose in free markets. This action enforces the Constitution's "post Roads" restriction (link). Choices: Liberty is tolerance of distruptive minorities offering choices. Inventors are often a minorith of one person who radically disrupts entrenched interests. Sorting of Choices: Liberty is tolerance of sorting choices in free markets. The Wisdom of the Many, the aggregated wisdom of all of us, with each of us acting in our own self-interest is wiser than the wisest of us at choosing between choices (Ref: The Wisdom of Crowds). 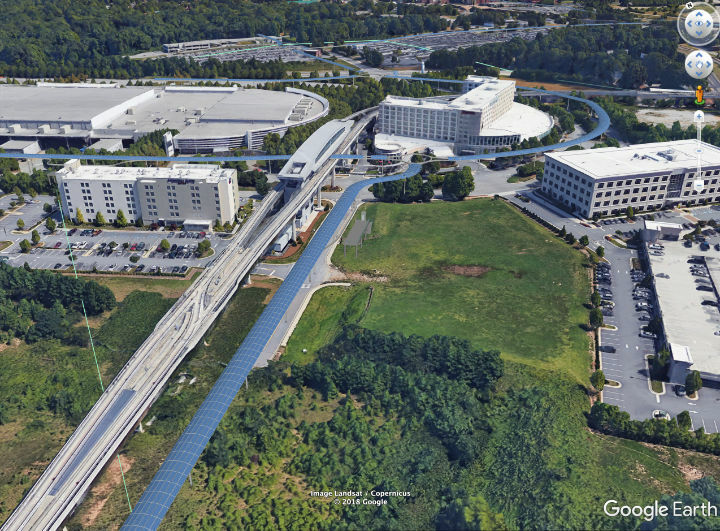 $ 2.3 billion/year, car damage, bad roads (link). Senator Brendon Beach invited Madgie Murray and Bill James to present to the Georgia Legislature's Transportation Committee on March 5, 2019. 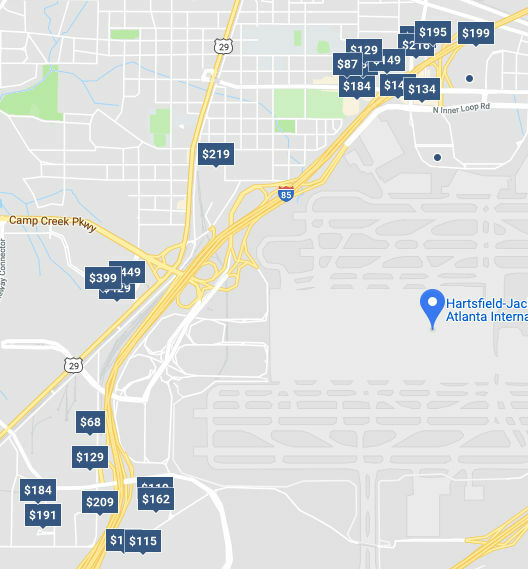 Illustration of JPods stations at ATL Hartsfield-Jackson Airport. 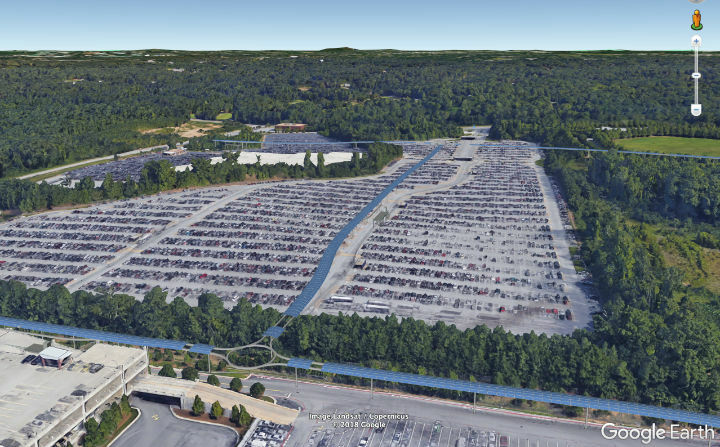 Stations are also in the adjacent parking lots. JPods stations at the Georgia International Convention Center, Mariott Gateway, Renaissance, and Spring Hill hotels. 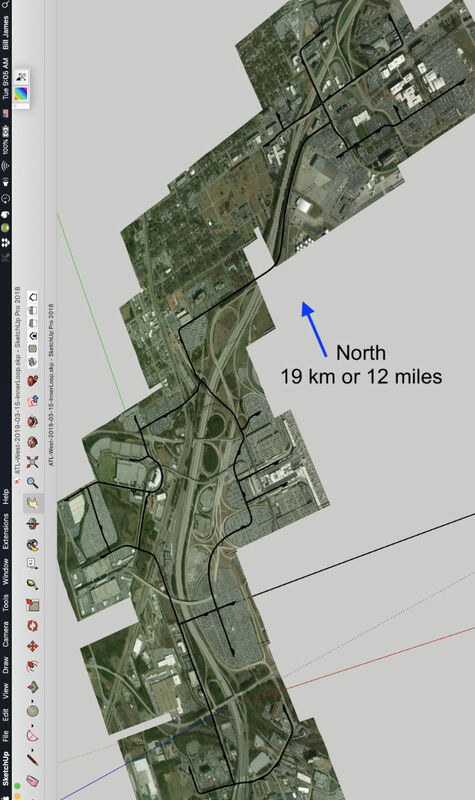 Stations and JPods connections between parking areas, car rental, and the Convention Center (off screen upper right). Map of the hotels connect by the network. JPods3D model of the network. TEDx Atlanta, 2011. It has been a long process to restore liberty to innovate. Traffic is horrible. Traffic has just gotten worse since this 1972 news story by Walter Cronkite on Tricia Nixon opening the first digital transportation network. The Morgantown PRT network has since delivered 150 million oil-free passenger-miles with only two minor injuries. Injuries on roads are 11,200 per million (link). JPods LLC and the Georgia Mobility Company LLC pay to build our solar-powered mobility networks. We are investors, not vendors. We are taxpayers. We pay 5% of our gross revenues to use the public Rights of Way. The 140 times greater efficiency of freight railroads ($0.01 per passenger-mile in graph below, link). The on-demand service of a physcial version of the Internet, a network of Horizontal-Elevators™ (link). The 50,000 times better safety of theme park thrill rides (link). 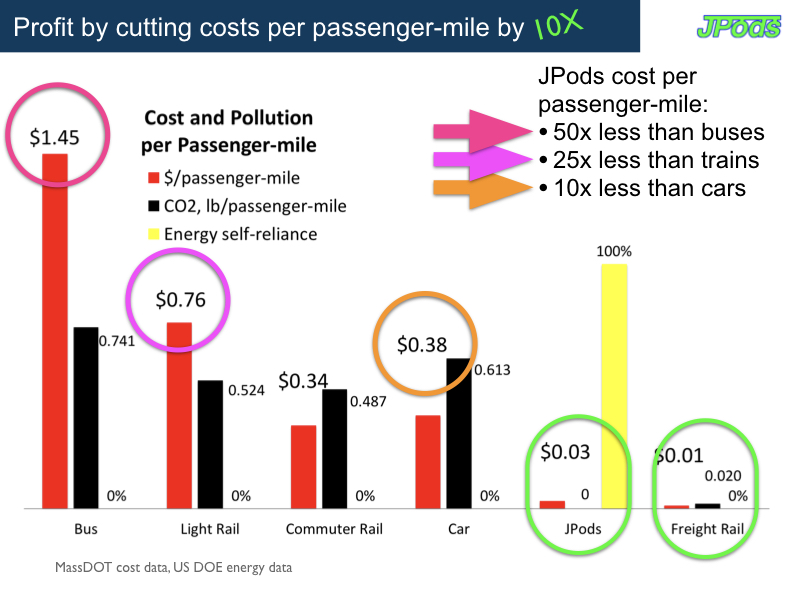 JPods Networks are 10 time to 50 times less expensive per passenger-mile that cars and buses. Because of a century of centrally plan infrastructure, it surprise Americans to think that infrastructure should be privately funded. But building of the Internet and Transcontinental Railroads provide case studies in why infrastructure should be privately funded. "20-mile marching", incremental, steady, disciplined, step by step efforts. "Fire bullets, then cannon balls", tinkering by starting small and iterating relentlessly. Profit by serving the fare box payers with greater value than the cost to compete. Repay construction captial every 12 months by selling completed networks to LMCs to operate. From survey to certification of rail should take no more than 9 months once the manufacturing base is ramped to scale. Complete 3 to 10 miles of networks per day per crew, matching the pace the Transcontinental Railroads were built in the 1860s. Contract signed on 2018-01-17 to build the world's first solar-powered mobility network by Dec 2019.